N.J. Assemblyman Raj Mukherji (D-Hudson). 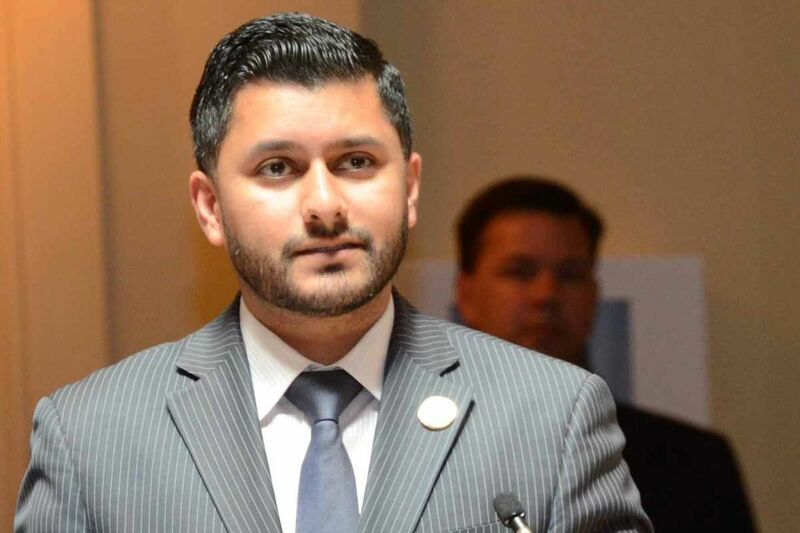 N.J. Assemblyman Raj Mukherji (D., Hudson) is a major player in the regional medical marijuana industry and was recently elevated to majority whip, but he'll be on the sidelines for the vote on full legalization to avoid any appearance of a conflict of interest. Mukherji is a lawyer who works for Garden State Dispensary in Woodbridge, one of the five operating medical marijuana Alternative Treatment Centers (ATCs), and some of those facilities are seeking a deal to supply the first cash crops of adult-use cannabis. Mukherji explained his careful posture: "I abstain from all marijuana legislation affecting licensure. Vote-counting for that bill will be left up to the deputy whip." Registered patients have also reported being unhappy with the luxury-level prices at the ATCs, making New Jersey's cannabis consumers deeply skeptical of having them spearhead recreational sales. Mukherji's reply to that sentiment: "Ideally, they would have their act together so that all the newly licensed folks could sell to the public and you wouldn't need medical ATCs to sell [recreational] product. It's just that regulators have not been able to do that in a timely manner in the other states. But as I said, I won't be involved with any of that regardless. I don't even express my opinion on legalization specifics to other lawmakers on it when approached — I shut down the conversation." Much to his credit, Mukherji has been completely transparent and his overall views on full legalization are very progressive. That makes it even tougher knowing that the he is silencing that passion in the upcoming debate. There is no law or regulation that prevents a sitting legislator in New Jersey from moonlighting among the medical marijuana permit holders. Being an elected member of the Assembly is a part-time job, and most legislators have busy professional careers while holding office. So, there's certainly nothing unusual about Mukherji's working in the cannabis industry. In fact, it may be much more common for legislators to earn a salary paid by cannabis consumers in the near future. Along with Garden State Dispensary, Mukherji helped win additional medical marijuana operating permits in Delaware, Maryland and Pennsylvania. In fact, all of the nonprofit New Jersey ATC operators have created nice side businesses of trying to scoop up permits from Ohio to Florida. In our region, these are exclusive state contracts creating small cartels of operators, ones that set uniform prices across the markets. Paying the bills are seriously ill residents who can never rely on insurance to help defray the costs, always forking over cash for limited strains of cannabis. New Jersey's ATCs have management teams, associated business entities and advisory boards stacked with former and current government officials. This could present complications with Sen. Nicholas Scutiari's bill or any push to jump-start cannabis sales through those facilities. Without diving into a legislative debate, Gov. Murphy could exponentially expand the medical marijuana program largely on his own authority. The tallest hurdles to patient access are actually found within the Christie administration's regulations. Ken Wolski, a registered nurse and co-founder of the Coalition for Medical Marijuana New Jersey (CMMNJ), said that by April 25 the Department of Health will be required to make some decision on 43 recommendations to expand the compassionate use program; the list was already approved by an expert panel. Wolski notes that cutting the 7 percent sales tax to patients, eliminating the mandatory registry requirement for participating doctors and increasing the number of dispensaries could all be addressed immediately by Murphy's new administration and NJDOH. "I support allowing the current New Jersey ATCs to begin retail sales of marijuana to adults, since this could speed up access to the legal market, as long as the needs of patients in the state's Medicinal Marijuana Program are met first," said Wolski.